Happy Year of the Rooster! 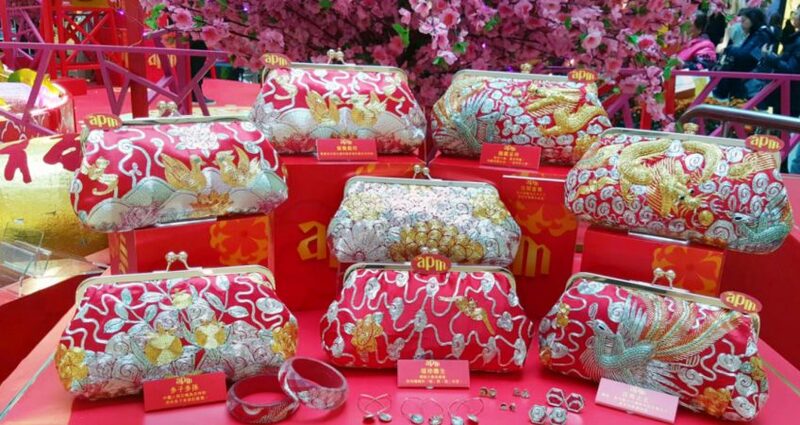 We are so happy to announce that a small selection of Southern Chinese wedding embroidery qun kwa clutches and accessories are at the apm wedding exhibition until February 15, 2017. The kwa clutches are made from upcycling end of use rental southern Chinese wedding dresses salvaged from traditional Chinese wedding shops in Hong Kong. After the embroidered fabrics are cleaned and reinforced, they are carefully cut and crafted into unique handbags and accessories in our workshop in Hong Kong. The jewellery and accessory pieces are fruits of a collaboration with Rachel Smith, founder of Senselessart, who places precious fibres under crystal clear resin, turning the tiniest pieces into beautiful jewellery. Through this collaboration, we hope to achieve a zero waste making process, ensuring that even the smallest pieces of this intangible heritage fabric are preserved. Link to apm Mall Facebook Page. We have been received featured on TVB’s show called 文化新領域 , if you are in Hong Kong, you may view the re-run on myTVB.com.